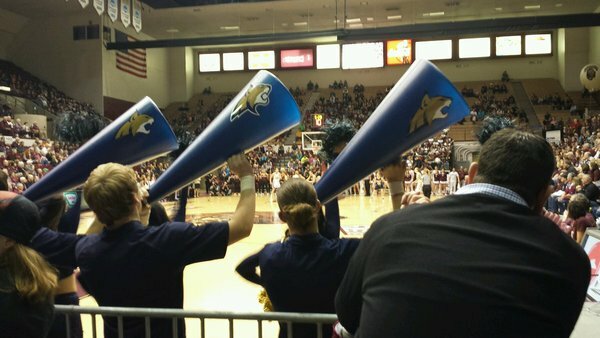 Live coverage from the Bozeman Daily Chronicle of Montana State's road basketball game against rival Montana on Feb. 20, 2016. Regular starting lineup for MSU: Stockton, Junkermier, Nordgaard, Hommes Dawkins. For UM: Valley, Sima, Isaak, Vining, Isaak. Really good crowd here as always. Grizzlies lead Big Sky in attendance almost every year, probably because this place is sweet. MSU started 3-3 and has a 6-0 lead. Feller, out last 3 games, with a couple missed 3s. Early, MSU moving the ball very well. Wide open shots on about every possession so far. MSU leads 8-4 at 4:45 into first quarter. MSU's defense doing a great job challenging passes. Lindsey Stockton looks aggressive on offense, but so far no points. UM 5-16 from the floor. MSU 5-15. Riley Nordgaard plays with a ton of energy, but sometimes, she's out of control. Showed on that last possession where she drove into the lane and tried to pass to Peyton Ferris, but barreled into a defender and was called for an offensive foul. UM collected two offensive rebounds and ties the game at 14, 8:00 into the 2nd. UM takes first lead of the game on a Vining jumper. 16-14, 7:29 in the 2nd. Grizzlies 8-23, 0-5 from 3, and have attempted 0 free throws. Bobcats 5-17, 0-1 from 3 and 4-4 from FT line. Really, an ugly game for both teams offensively. Feller nails a 3, her first points. MSU turns the ball over at the other end. 4:30. Griz lead 21-16, 5:09. A quarter like this is not out of the ordinary for MSU. In fact, Dawkins has been the only scorer in a quarter for maybe two games this year. A UM fan about the refs: "You guys are something else." A nice drive a layup through contact. Could hear a foul from where I'm sitting. Should have been an and-1. But UM hits a 3 on the other end and leads 28-20, 2:37 left to halftime. TO MSU down 28-20, 2:13 left. 'Cats with eight turnovers, 7-23 from the field. A beautiful pick and pop from Caudill-Hommes, but Sims responds on the other end. Crowd on its feet for last MSU poss. Ball goes to Hommes, who drives and puts up a left handed shot. It gets stuck between backboard and rim. Feller jumps, hangs on rim and swats it loose. A final half-court heave from Sierra Anderson just misses, and Griz lead 32-22 at intermission. MSU: 8-26, 0-3 from 3, 6-6 from FT line. Hommes leads with 10 pts, five rebounds. Dawkins with 6 pts, Nordgaard 4 and Stockton 2. UM: 14-33, 2-8 from 3, 2-2 from FT line. Valley and Sims each with 8. Big stat looks like MSU with 10 turnovers. UM with just 3. Bobcats have edge in rebounding 21-16. MSU started with 3 straight baskets to begin game, then didn't hit back-to-back FGs the rest of the half. From 51 secs left in 1st quarter to 6:38 in 2nd, UM went on an 11-0 run. Tough stretch. It's a good time to note with the 'Cats clearly out of sync that they haven't ever been able to win in Missoula. UM leads series at home 44-6. Binford has won at UM just three times in her 11 seasons. Hommes connects, then Valley hits on the other end. That's how it's gone for MSU since the outset. Peyton Ferris with a layup and-1, and she has her first points of the game at 6:56 in 3rd. MSU down 37-27. Have never seen Ferris struggle like this. She just missed a wide open layup feet away from the rim. Usually automatic right there. Ferris was 0-4 in the first. MSU bench didn't score. Most likely first time all season it's been held scoreless all year. UM leads 39-29, 4:34 left in 3rd. Bobcats offensive struggles continuing in 2nd half: 3-11 so far. Best lineup on the floor now for MSU: Stockton, Caudill, Nordgaard, Hommes, Dawkins. Down by 12 with 3:59, and t hen Stockton hits a layup. 41-31. ..... on the other end. Hannah Doran a layup and-1.